Free Shipping Included! 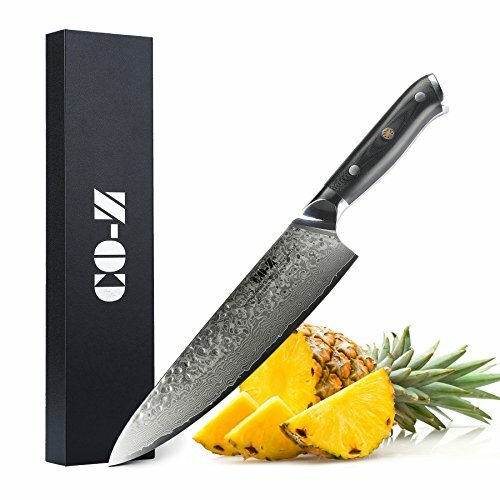 Chef Knife 8 Inch, Professional Chef's Kitchen Knives - 67-Layer Japanese VG10 Super Steel with Super Edge Retention, Stain & Corrosion Resistant - Fiberglass Laminate Handle by CO-Z at Sara Stage. MPN: DKK-2017-01. Hurry! Limited time offer. Offer valid only while supplies last. Description: A knife suited primarily for cutting meat into pieces. It can also be used as a multi-purpose knife for cutting fruits and vegetables. A knife suited primarily for cutting meat into pieces. It can also be used as a multi-purpose knife for cutting fruits and vegetables. Our knives are unique because of their edge and the way they are balanced. Our knives are sharpened or ground on both sides of the blade like western style knives. However, their edges are ground straight to a point rather than beveled resulting in a dramatically sharper knife which stays sharper longer. VG-10 JAPANESE SUPER STEEL: Designed with ultra-sharp VG-10 Japanese Damascus steel cutting core at HRC58-60 hardness, this 8" crafted culinary chef knife can chop or slice meat, vegetables, fruits , proteins and other foods with ease; cobalt added VG-10 steel outperforms AUS-10 steel in durability and is easier to sharpen as cobalt enhance the other alloying elements. ERGONOMIC & BALANCED DESIGN: 8'' and slightly curved blade (sharpened on both sides, western style) help to alleviate fatigue and pains on your fingers after long time slicing or chopping, providing cooking with comfort; weighed at 0.9 lb., our knife provides you with the perfect blend of performance and comfort. REINFORCED HARDNESS: ruthlessly sharp scalpel-like edge is handcrafted by seasoned artisans to a mirror polish at 13-15° per side using the traditional 3-step Honbazuke method; Nitrogen cooled for ultimate hardness, flexibility and corrosion resistance performance. TREATED HANDLE FOR EXTRA DURABILITY: the elegant rosewood handle has gone through special treatment for excellent and long lasting waterproof and anti-mold performance; comes with 3D bamboo root pattern and matte finish for elevated stunning appearance. LIFETIME WARRANTY, no premium knife is complete without a lifetime warranty, our masterpiece knife is fully covered for life, free exchange or return for life if the item is defective.